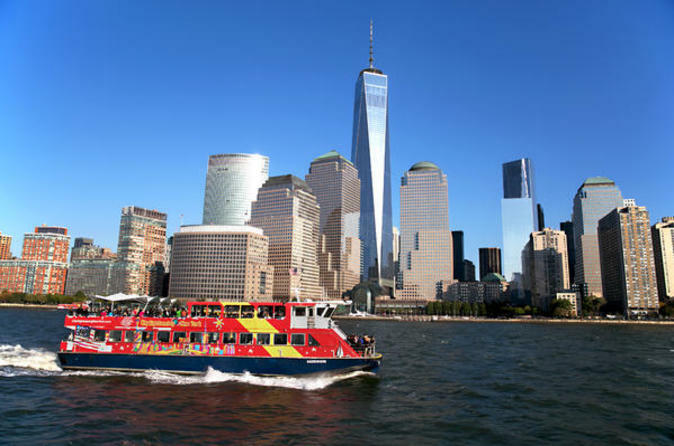 This New York City Downtown experience includes a 24-hour Downtown Hop-on Hop-off Double Decker bus tour, Hop-on Hop-off cruise, admission to One World Observatory and 9/11 Museum for a full experience of lower Manhattan. See the sights at your own pace. Explore Downtown Manhattan with this all-inclusive tour package! The Downtown Experience offers the chance to see it all plus flexibility and convenience. On your Downtown Loop Hop-on Hop-off bus tour, a knowledgeable and professional guide will offer insightful narration as you pass through Times Square, Chinatown, Little Italy and Battery Park – just to name a few of Lower Manhattan’s fascinating neighborhoods. You’ll see incredible sights, such as the Empire State Building, the Brooklyn Bridge, the Statue of Liberty and more! Simply hop off at any of the 21 convenient stops throughout the city and wander at your leisure. When you’re ready to continue the tour, hop back on the next bus! On your Hop-On, Hop-Off Sightseeing Cruise, which includes 4 hop-off locations for optimal exploration, you’ll have the unique chance to discover NYC from the water. The 1.5-hour cruise boasts unobstructed views of the Manhattan skyline aboard a relaxing ferry boat with indoor and outdoor seating. You’ll also have included entry to two of the most popular NYC attractions, the 9/11 Museum and One World Observatory at One World Trade Center. At the 9/11 Museum explore the story of 9/11 through interactive technology, archives, narratives and a collection of artifacts. Finally, ascend to the top of the tallest building in the Western Hemisphere in less than sixty seconds. Explore three levels filled with innovation and inspiration – and some of the most stunning views in the city!